Sir Terry Leahy, the boss of supermarket giant Tesco, has seen his pay package rise by 25%, hitting nearly £4m, including bonuses of £2.8m. Sir Terry's pay, boosted by sales which hit £41.8bn in the past year, was published in the firm's annual report. Tesco, which has a 30% share of UK supermarket sales, has been accused by critics of being dominant. 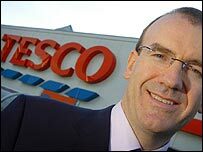 The news of Mr Leahy's pay rise comes as the supermarket announces plans to increase sales of home computers. Initially 50 of the firm's larger Tesco Extra stores would sell computers, with laptops costing under £400, and desktop computers costing under £300. Samsung, Toshiba and Gateway would be among the brands on offer, the company said. Tesco now wants computers, which have been sold in the past but not consistently in stock, to be permanently available. The firm, which saw profits reach £2.25bn in the past year, has increasingly branched out into non-food goods, such as electrical goods, music and clothes. Tesco, among others, is being scrutinised for its position in the market place. The UK's Office of Fair Trading is deciding if it should embark on a full competition inquiry into British supermarkets, amid concerns that they are forcing out smaller, independent stores. Sir Terry recently rejected suggestions that Tesco was now totally dominant in the UK supermarket sector. Meanwhile environmental groups such as Friends of the Earth believe Tesco has a 45% share of supermarket sales in some towns and its growth must be limited.